Garson, G. D. (2012). 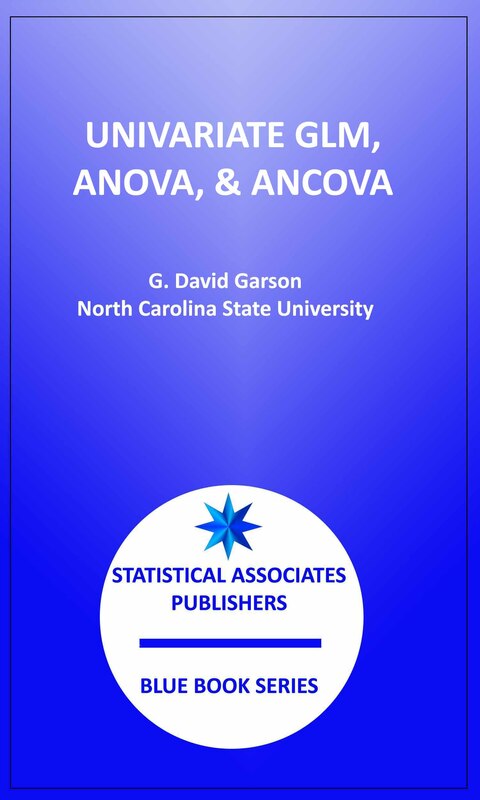 Univariate GLM, ANOVA, & ANCOVA. Asheboro, NC: Statistical Associates Publishers. ASIN number (e-book counterpart to ISBN): ASIN: B0092TNOGW . Univariate GLM is the general linear model now often used to implement such long-established statistical procedures as regression and members of the ANOVA family. It is "general" in the sense that one may implement both regression and ANOVA models. One may also have fixed factors, random factors, and covariates as predictors. Also, in GLM one may have multiple dependent variables, as discussed in a separate section on multivariate GLM and one may have linear transformations and/or linear combinations of dependent variables. Moreover, one can apply multivariate tests of significance when modeling correlated dependent variables, not relying on individual univariate tests as in multiple regression. GLM also handles repeated measures designs. Finally, because GLM uses a generalized inverse of the matrix of independent variables' correlations with each other, it can handle redundant independents which would prevent solution in ordinary regression models. Data requirements. In all GLM models, the dependent(s) is/are continuous. The independents may be categorical factors (including both numeric and string types) or quantitative covariates. Data are assumed to come from a random sample for purposes of significance testing. The variance(s) of the dependent variable(s) is/are assumed to be the same for each cell formed by categories of the factor(s) (this is the homogeneity of variances assumption). Regression in GLM is simply a matter of entering the independent variables as covariates and, if there are sets of dummy variables (ex., Region, which would be translated into dummy variables in OLS regression, for ex., South = 1 or 0), the set variable (ex., Region) is entered as a fixed factor with no need for the researcher to create dummy variables manually. The b coefficients will be identical whether the regression model is run under ordinary regression (in SPSS, under Analyze, Regression, Linear) or under GLM (in SPSS, under Analyze, General Linear Model, Univariate). Where b coefficients are default output for regression in SPSS, in GLM the researcher must ask for "Parameter estimates" under the Options button. The R-square from the Regression procedure will equal the partial Eta squared from the GLM regression model. The advantages of doing regression via the GLM procedure are that dummy variables are coded automatically, it is easy to add interaction terms, and it computes eta-squared (identical to R-squared when relationships are linear, but greater if nonlinear relationships are present). However, the SPSS regression procedure would still be preferred if the reseacher wishes output of standardized regression (beta) coefficients, wishes to do multicollinearity diagnostics, or wishes to do stepwise regression or to enter independent variables hierarchically, in blocks. PROC GLM in SAS has a greater range of options and outputs (SAS also has PROC ANOVA, but it handles only balanced designs/equal group sizes).